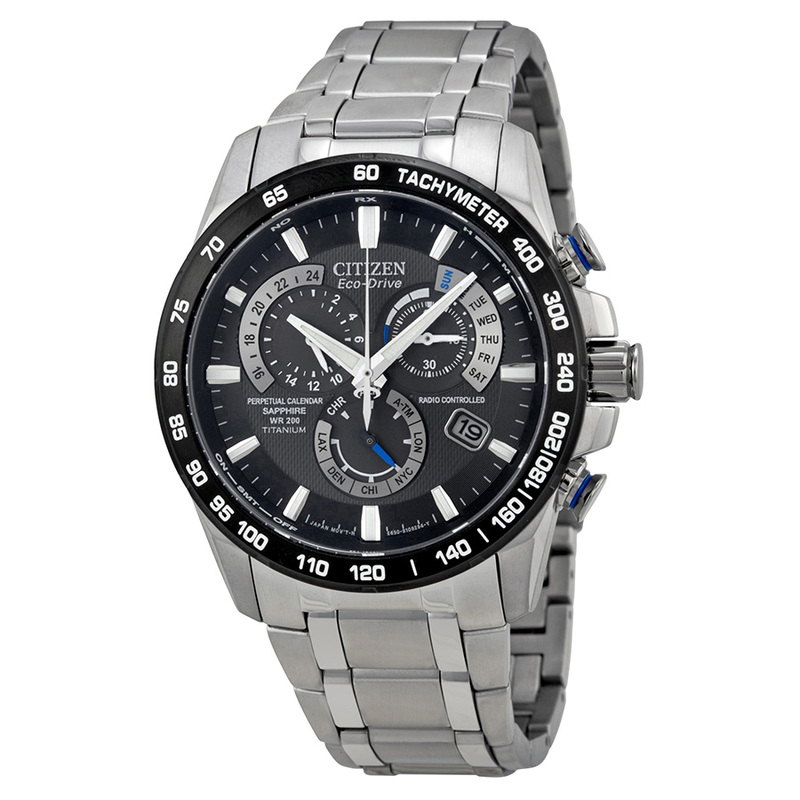 Cool looking chronograph watch are popular but what are the best chronograph watches for men? This post will list down 5 of the best chronograph watches for men I’ve reviewed on this site. Now let’s get on with it shall we. 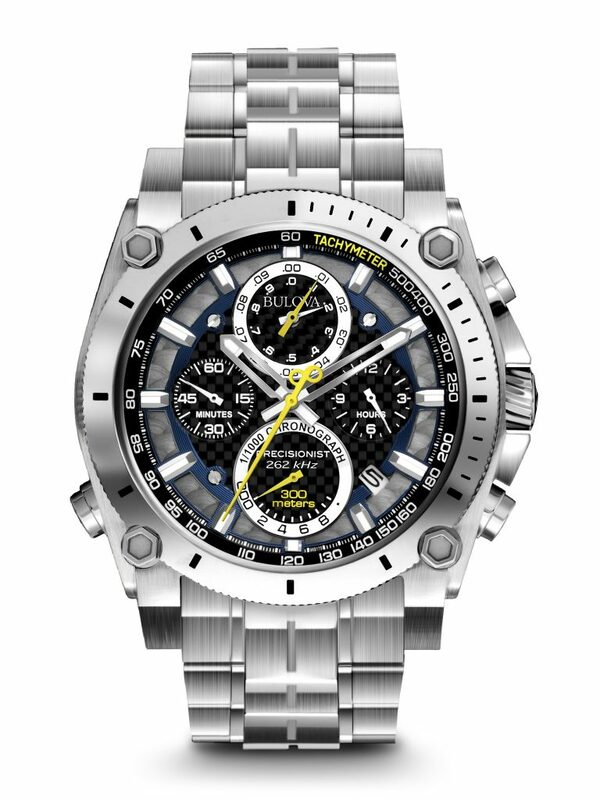 I have to say this Bulova Precisionist is technically the best chronograph watch with analog display. The watch looks totally rugged with its big dimension and distinct styling. The watch construction is highly detail, and I’ve never seen any other watch case that has been put so much effort in designing and crafting such as this watch. Its run by Bulova Precisionist movement, a cutting edge quartz movement from the legendary watch maker. For a start, this quartz watch is very accurate up to 10 second per year whereas normal quartz watch is only accurate up to 10 second per month. The 262kHz on the dial signifies the very high vibration rate of the quartz movement (262144 cycles per second) that is 8 times more than normal quartz watch. It also features a smooth sweeping seconds hand, a feat that Bulova achieves by their own patented movement. The chronograph function is sort of extraordinary. First, the chronograph seconds hand and running seconds hand is the same that is the big seconds hand. This is only exclusive with quartz watch though. Automatic watch chronograph cannot do this and need two different seconds hand for both function. This is one of the reason why I personally favor quartz chronograph over automatics. It’s able to measure up to 1/1000th second which is just outstanding. To put in context, the Bulova Precisionist enables you to measure time until 57.845 second – that’s something you can only do with digital watch. 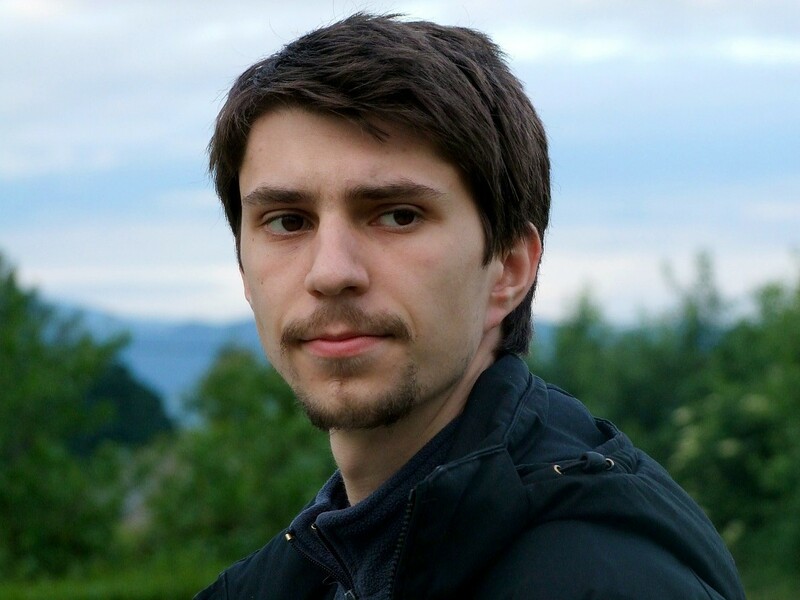 And did I mention it looks great with the very smooth sweeping seconds hand? For a tough and rugged watch that’s also a very accurate chrono, this is the best option for you. Another quartz chronograph on the list. 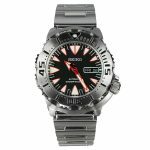 This time its this popular aviation watch from Seiko. 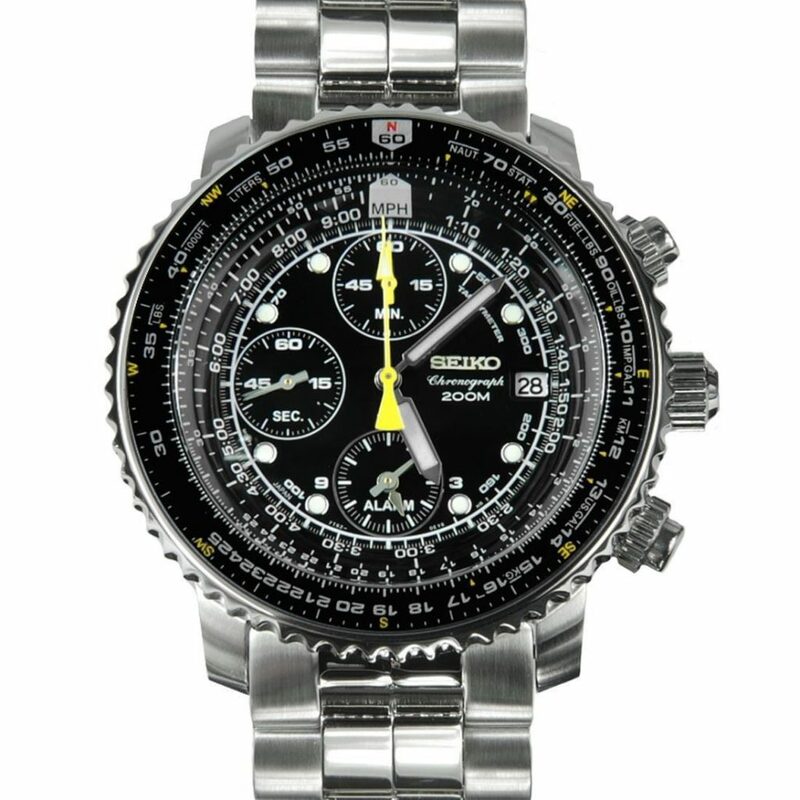 The Seiko FlightMaster SNA411 is very popular because of the cool technical look of it. It has lots (and I really mean LOTS) of scale on the watch. It has rotary slide rule (useful for various simple mathematical calculations such as multiplication, division, even square roots), compass ring, tachymeter, conversion scale (weights, length, volume) and a few others. 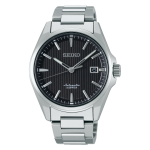 Seiko was able to incorporate those utility scales into a good looking and cool watch. The chronograph has split time function, which means it can pause the display while still recording the time measurement. For instance, we can stop the chronograph display (the time measurement is still continuing in background), take our sweet time to jot down the time display somewhere and then by one click, the display will catch up to the actual time measurement. Very useful for racing events that involves many laps. This FlightMaster SNA411 is a very utility and tool like aviation watch. If you need a chronograph that’s not just look cool but also have all the tools that a pilot uses, this would be the perfect choice for you. Every night at 2 am, this watch will try to get radio signals and automatically sync its time to atomic time. Considering the accuracy of a typical quartz watch is about 10 second per month, this watch definitely has the best accuracy of any watch at any time because it syncs every day! Just to be clear, it only works in the 4 major timezones in US (Eastern, Central, Mountain, Pacific) plus London timezone only. Besides that, it also has perpetual calendar (meaning we don’t need to change the date to suit leap years), fully functioning chronograph and even alarm clock! Encased in titanium made the watch much lighter than normal stainless steel and perfect for those that has allergy to normal steel. Wanting a state-of-the-art watch powered by solar and always accurate? Then this is the watch for you. Who says only smartwatches can be a technology gadget? Let’s move on to the Swiss chronograph watches for men. 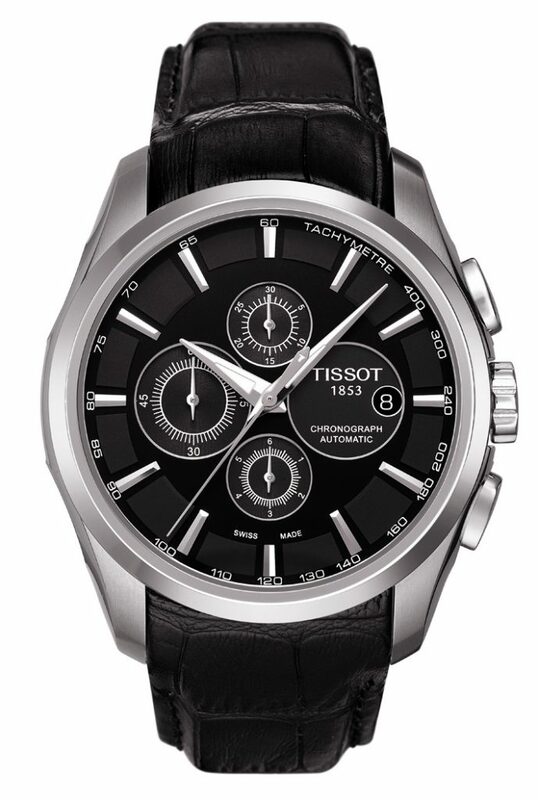 Tissot has created this amazingly sleek chronograph that looks really elegant. Just compare its look to the other chronographs listed above and you will get what I mean. Tissot also produces many super cool sporty chronograph watches (such as their MotoGP limited edition watches) but they never forget their root and still continue producing elegant Swiss automatics for their fans. The face of this watch is pitch black, contrasted by the signatures, markers and hands on the dial. It looks absolutely stunning on a black leather strap, and look quite formidable with its 43 mm diameter and thick lugs. The chronograph automatic movement is made by Swiss ETA featuring their C01.211 movement. For a quality Swiss chronograph watch, that is still affordable, this is it. Last but not least is another Swiss chronograph watch but this time with military/field watch styling. The Victorinox Swiss Army (or VSA) Infantry Chronograph has a very good looking military style design with gunmetal PVD case for that rugged look. Coupled with luxuriously applied lume on the dial, this is a full fledged handsome field watch. This watch is powered by ETA Valjoux 7750 automatic chronograph movement – a legendary chrono movement in Swiss watch making history. 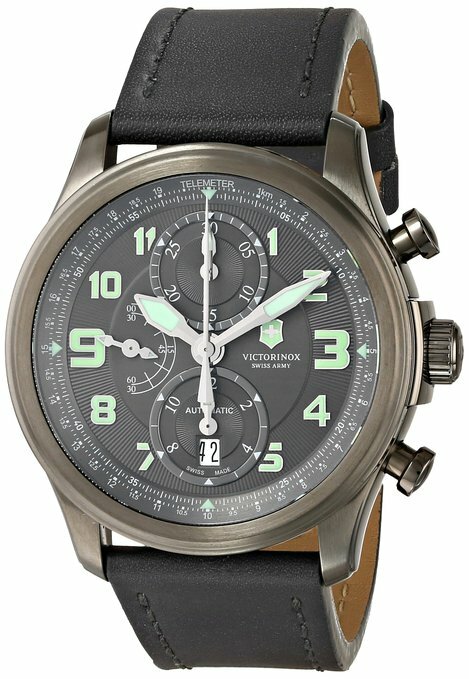 One unique feature is the telemeter scale on it (it seems that Victorinox is hell-bent to create a real military watch with this feature). For a more adventure type of chronograph with automatic movement and made with Victorinox’s Swiss high quality craftsmanship, it can’t get better than this. Now, you might realised that in this list I’ve listed many quartz chronographs right? But this is supposed to be an automatic watches blog for men? Well, the truth is it’s very difficult to find an automatic chronograph watch that is affordable. Swiss automatic chronographs mostly retails more than $500. Some Chinese watchmakers do produce automatic chronos for cheaper prices but I’d steer clear of them until a clear quality record has been established and verified. Fact is, automatic chronograph movements are very complicated and hence very expensive. Quartz chronographs on the other hand will cost much less and has more features- the Seiko FlightMaster SNA411is a good example of how cheap a high quality quartz chronograph can be. 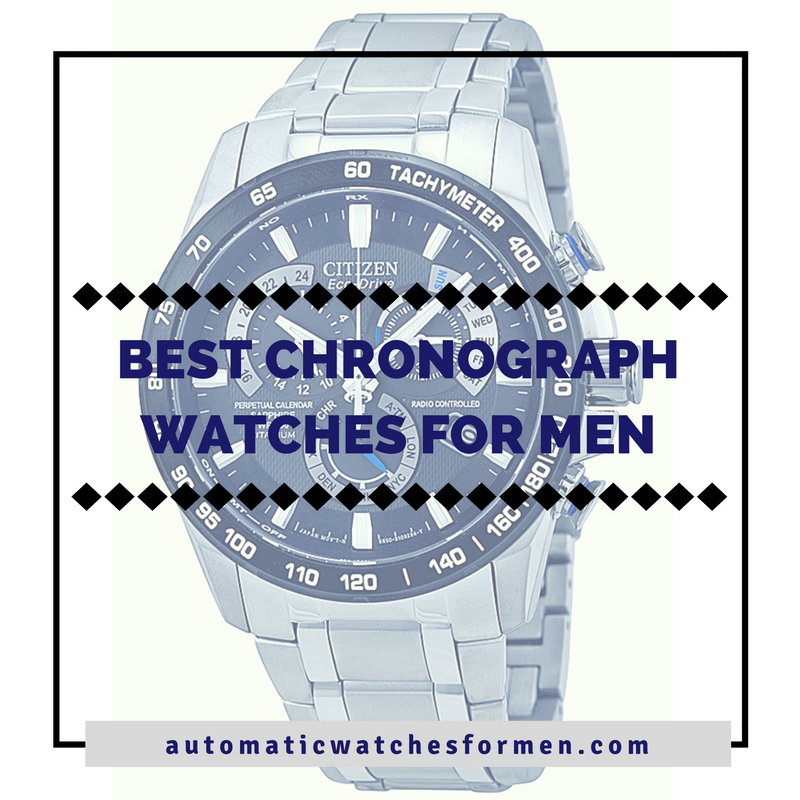 I hope you guys find this list of best chronograph watches for men useful. If you have any questions, feel free to put it inside the comments section below. Till next time.